The Portuguese Azores have had a profound effect on the maritime traditions of Gloucester, Massachusetts and my life growing up on it’s shoreline. I am excited to experience the islands that launched the migration of Portuguese fishermen who brought their culture to Gloucester. I am curious to see the marine flora and fauna that populate the waters off of Pico Island, but also to meet the people and witness their local customs. 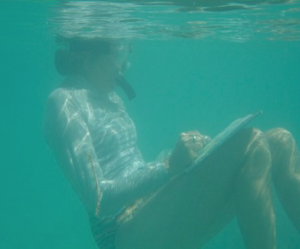 I propose to snorkel and paint underwater while participating in the “Once Upon Water” artist residency in June, 2017 on Pico Island, Azores. The color studies created on 300lb watercolor paper with oil pastels will be used to produce larger paintings in oil on panel, documenting the experience of the undersea light on the opposite side of the Atlantic Ocean from where I live and work. The North Atlantic Ocean has been a source of wonder for me since my early childhood. I learned to swim and to sail in the summertime at Coffin’s Beach. Today, long practiced water skills allow me to engage with the rhythms of the marine ecosystem where I feel a deep spiritual connection with nature. I paint images of the inter-tidal zone to record the human experience of light under the waves. I am concerned that current photographic technology is creating an incorrect record of this habitat that is adjusting to climate change and will be forever changed. Kimberly Collins Jermain is a painter and teacher who’s artwork explores coastal environments and color phenomena. She also uses her illusional skills as a painter consulting for architecture. Collaborating with architects and designers, Kimberly’s site specific consultations bring the skill of “color perspective” to the built environment. Color, the principal tool of the painter, has the power to adjust the visual experience of architecture efficiently and economically for better design outcomes and sustainable practices. Kimberly’s creative career has been to share what she has observed about color in nature and put it to use for living well.